Two months ago, I embarked on a research project that veered off in unexpected directions, metamorphosing into a more time-consuming and labour-intensive exercise than anticipated. Along the way, I learned a great deal about how science gets practiced in the real world – as opposed to the idealized “Science” of my imagination. Yes, I’d known full well that climate science was a mess. Rather than inspiring confidence, legions of its practitioners act as though they’re selling something. On the one hand, they’re quick to dismiss alternative perspectives. On the other, they grasp at every half-baked rationale available to advance their own worldview. And yes, I’d already begun to notice parallels to the scientific debate concerning cholesterol, dietary fat, and heart disease. But my recent adventure has persuaded me that the scientific enterprise, as it is now conducted in government-funded universities, is far more dubious than I had hitherto appreciated. I’m currently reading a book that was published in 1982, the year I left high school. 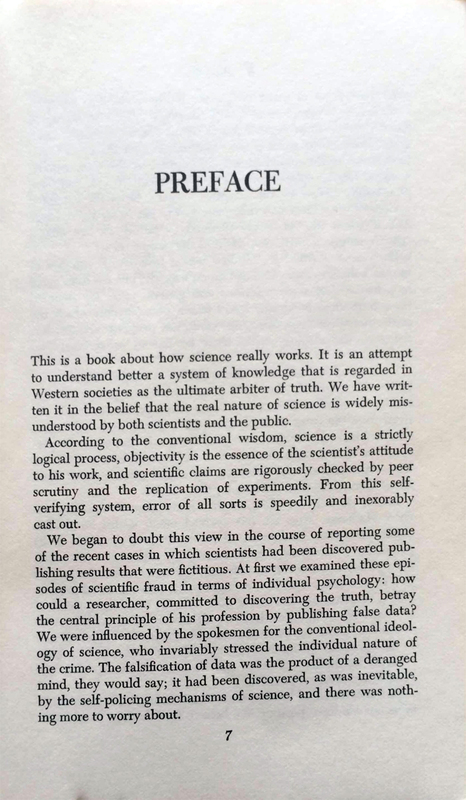 William Broad and Nicholas Wade, two New York Times journalists, had figured out 34 years ago something with which I am only now coming to terms: the reality of science is so far removed from the ideal that vast swaths of what we think we know may be nonsense. According to the conventional wisdom, science is a strictly logical process, objectivity is the essence of the scientist’s attitude to his work, and scientific claims are rigorously checked by peer scrutiny and the replication of experiments. From this self-verifying system, error of all sorts is speedily and inexorably cast out. 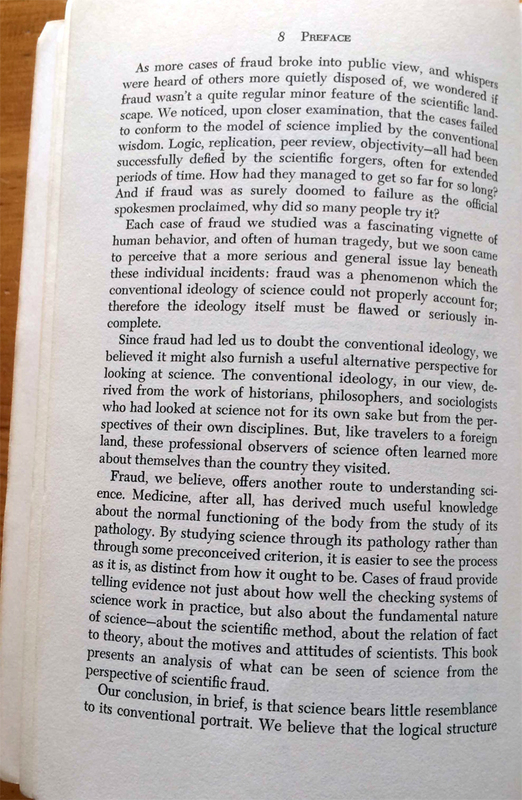 Our conclusion, in brief, is that science bears little resemblance to its conventional portrait…In the acquisition of new knowledge, scientists are not guided by logic and objectivity alone, but also by such nonrational factors as rhetoric, propaganda, and personal prejudice. Scientists do not depend solely on rational thought, and have no monopoly on it. We live in a world in which all sorts of government policies are justified by pointing to scientific evidence. But since at least the early 1980s, grave concerns have been raised about the process by which this very evidence gets produced. It is taking an awfully long time for those concerns to gain traction. Readers have noted that it’s still possible to purchase this book. Amazon.com links to third-party sellers offering new and used copies. Copies may also be purchased via Abebooks.com. and BookFinder.com. A comment left on this blog’s Facebook page further points out that a pirated, non-searchable, free PDF version is also out there. Even if you purchase a brand new copy, the authors are unlikely to see any revenue since, when out-of-print books are dumped by publishers, those copies become the equivalent of used books. It’s important that the research and analysis this book represents not be lost. But the only way its authors will earn another nickle for their efforts is if an e-book were to be issued. 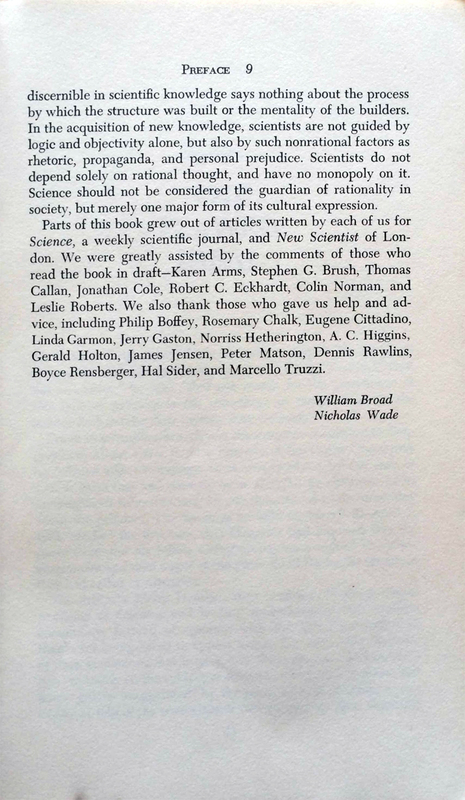 See William Broad’s more recent books here and Nicholas Wade’s more recent books here. This entry was posted on April 1, 2016 by Donna Laframboise in books, ethical & philosophical and tagged Betrayers of the Truth (book), Nicholas Wade, William Broad.